Lost and Found Dogs NJ and PA! Dogs In Urgent Need of Rescue! Start Your Search Here in NJ and PA! Do you know what to do if your pooch or kitty accidentally gets lost or wanders away from home? The following tips will help you and your family find your pet. ID Your Pets It is a good idea for all of your fuzzy friends —even indoor pets—to always wear a collar with an ID tag. The ID tag should have your name or your parents’ name, and telephone number or address. Hide and Seek As soon as you notice that your animal friend is missing, tell an adult. Make sure to search your home carefully—under beds, in closets, dark places, small places, behind bulky furniture—in case your pet might be hiding or sleeping somewhere. Call for Help Have an adult contact your local shelter, humane society, animal control agency or SPCA. If there are no shelters close to your home, contact the police. It is very important that your pet is described accurately. It will definitely be helpful if you have current photos of your pet. Close to Home With an adult helping you, walk or ride around your neighborhood. Ask your neighbors, and friends if they have seen your pet. Be sure to bring along a picture to show them. News Flash! You and your family should post signs and handout flyers in your community. If you ask permission, you may also be able to post signs in your vet’s office, grocery store and other local places. Include the name of your pet, current picture, if your pet is a male or female, age, color, breed, weight and any special markings. Make sure to include a number where your family can be reached if someone finds your pet. Don’t Give Up Many animals have found their way back home. If your dog was lost in the PA or NJ area, please check with the following shelters for your lost dog. Go to the shelters and look for your dog after visiting the websites. There are many more dogs at the shelter than what are shown on the page..
For me, the most frightening thing to think about where my dogs are concerned, is that one day one of them may take off out of the yard or break free from my grasp while going for a walk. Even more distressing, is the fact that they may wind up in one of the shelters that are so overcrowded, they euthanize dogs when their time is up, by law, if there is no kennel space available. That is why I have taken it upon myself to try and search for the guardians of dogs 'found as strays' in two area shelters. Here are a few websites where people can list their missing dog, or see if someone found their missing dog. The dog you brought home from the shelter or the pet store will need a lot of love and attention. They will need time to adjust to their new surroundings. This page is brand new and I will be adding lots of information for responsible, concerned dog guardians. Whether it is chewing, digging, housesoiling, or a host of other problems, there are solutions to all of these that do not include giving up your dog. I will list as many behavior problems as I can think of, and then I offer advice, information, and resources to help with those problems. The list will grow as time permits. Running Away? Escaping the Yard? Bolting Out the Door and Roaming the Neighborhood? I read about this problem in quite a few books and on several websites. Many say that spaying or neutering helps. I cannot attest to the effectiveness of this because all of my dogs were already neutered/spayed before I adopted them. That did not stop my only female dog from getting out of the yard and running around the block every chance she got. There is one small space in my yard that is not completely fenced in. My two male dogs either never knew that spot was there, or knew it was there and never even thought about leaving the yard. Needless to say, I bordered up the space, and I keep an eye on my escape artist when she is out doing her business just to make sure she doesn't find another way out. I live on a busy highway and it wouldn't take long for her to get hit by a car and so taking the time to watch her while she's in the yard is worth keeping her alive. I know a little bit about her background before she came to live with us, so although I understand why she's doing it, I cannot allow her to do it if I want her to remain safe. I do not have advice for those of you who keep your dogs outside all of the time, except to say "Bring them inside to live". I cannot even imagine anyone not having their dogs in the house with the family. For those of you who let your dogs out for their potty run, all I can say is that your yard needs to be fenced. Chaining a dog outside is cruel, in my opinion, even if it's only for a short while. Walk your dog to go to the bathroom if you do not have a fenced yard, or a yard big enough. Adult dogs do not have to go out that often. You can walk them morning and evening if you train them that way. My dogs don't like to go out when it rains, so on a day when it rains from morning to night, they go out twice only because they absolutely cannot hold it in anymore. They go out in the rain, go potty, and run right back in the house. They go out a dozen times a day just to explore and play, but they never have to go to the bathroom that many times. If your dog runs out the door everytime someone opens it, you have to train yourself and everyone in and out of your house to pay attention to where your dog is BEFORE you open the door. It might take some doing, but if you get used to it, it will become second nature. Just be aware of where your dog is when people come and go at your house. Do not let your dog near the door when you open it, it's that simple. Obedience courses are supposed to help with this problem. However, I am on the side of Bill Maher, who says that he does not train his dogs, because it takes away from their personalites. I agree. My dogs don't run around wild and do whatever they want, but we have reached an understanding just like children and other family members. There are rules, they know them, and we all do our best to enforce them. Dogs deliberately break rules to get a rise out of you, just like your kids will do, and they learn what is acceptable and what isn't by your reactions. Actually my kids have a harder time with this than my dogs do. If you are having problems, and you feel you cannot keep your dogs, there are alternatives to taking them back to the shelter. I have decided to list a few excuses people have used when taking their dogs back to the shelters because of problems. I will then list some things that people can do to correct the problems. All people have to do is make a little extra effort to look for help when they need it. It is not fair to return dogs to shelters when there are many things owners can do to solve their problems and keep their dogs. All the owners have to do is look for the help. Just ask for help; there is plenty of it out there if you're willing to look for it! Stop! You Could Be Handing Your Dog A Death Sentence! Before you decide to return your dog to a shelter, think about what will happen to your dog if he cannot find another home in a certain amount of time. There are so many shelters out there that will only keep dogs for the time allowed by law, and then they euthanize them for no other reason except that there is no room for them. How sad is that? 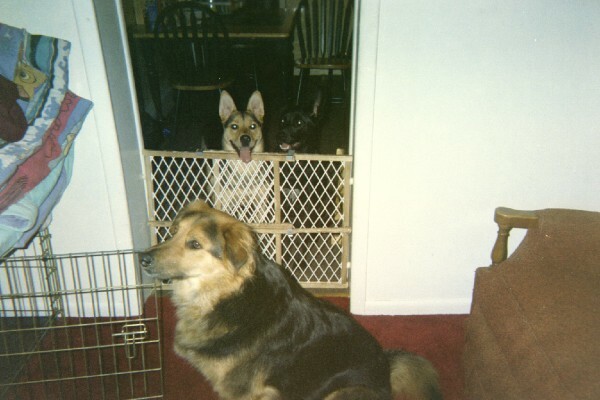 First, let me tell you that I am the guardian of three beautiful mixed-breed dogs, all adopted from my local shelter. I would not return my dogs for ANY reason. If I had to give up my dogs to move for a new job, I wouldn't take the job. If I were being evicted and could not take my dogs to a new home, I would be homeless until I could find a place. If moving to a new neighborhood would be a good thing for me, but not a possibility for my dogs, I would not move. If my husband told me I'd have to go or one of my dogs had to go, I would go WITH my dogs. Not everyone is like me, but my dogs are like my children. They are part of my family and I could not give them up. Moving? Being Evicted? New Place Does Not Allow Dogs! Everyone knows someone, right? Even if you have no family members, you have contacts, friends, co-workers. Try your family first. If no one in your family can take your dog, maybe one of them knows someone who wants a dog. They might know someone that is aware of a rescue group or they may have friends that are concerned dog-lovers who would be willing to foster your dog, or even adopt. If that doesn't produce a result, check with shelters and humane societies. Find out their policy on euthanization. Ask them right out if they would be able to keep your dog until a loving home can be found, or would they put your dog to sleep if his time ran out. Look on the Internet for rescue groups, for shelters, and humane societies. If you don't have access to a computer, look in the yellow pages. Another thing you can do is put up a few signs in your neighborhood. Even if someone right in your area cannot take your dog, someone driving by just might be someone who knows someone...and so on. There are endless possibilites. If you are going to lose your home due to a new job, or an eviction, or any other reason, chances are you have some notice. That gives you plenty of time to find a home for your dog if you positively cannot keep him. Your Dog Is Not a Puppy Anymore and He Got Too Big! Well, there is not magical drug that will turn your suddenly large dog back into a little puppy. There isn't anything you can do about that. The only thing you can do is to think about the problems you believe your dog is causing now that he is big. Is he knocking over things? Is he taking up too much space? Ever hear the expression, 'Don't sweat the small stuff"? If you have valueables your dog is breaking or ruining because of his size, the ridiculously obvious answer is to move these things out of the dog's reach, right? If your kids get too tall or gain too much weight, would you give them up? No, you would accomodate for that. Well, make accomodations for your dog. Impossible? Out of the question? Then refer to the excuse above and use the same tactics for finding your dog another home. There isn't anything you can do to shrink your dog or stunt his growth, at least not anything legal, so do your best to find him a loving home rather than send him back to the shelter. Or view my guestbook Here! Return to Dogs Are People, Too!